Looking for an inexpensive, healthy way to get more protein your diet? Beans are the key! Beans (and lentils) are the star players when it comes to plant-based protein. And if you learn to cook dried beans instead of relying on canned, you can save a ton of money. For example, a can of organic, no-salt added beans at my local co-op is $2.49 and yields about 1 3/4 cups of beans. I can get at least a pound of the same beans dry in the bulk department for the same price (or less), and they’ll triple in size to yield 6 or more cups once cooked. That’s almost 3 1/2 times as many beans! Do I even have to ask if you want to spend 3 1/2 times less on a daily staple? Check out the two most common methods for cooking, and get ready to embrace beans at every meal no matter what your budget. Simmering beans on the stovetop is a method that may seem old-fashioned, but it’s time-tested and results in tender, flavorful beans if you’re up for being patient. Since this method can take several hours, it’s best to try it on a quiet afternoon when you’re hanging out at home with the family or working in the kitchen preparing another long-cooking dish. If you forget to soak beans and still want to go the stovetop route, you can “quick soak” them for an hour to soften them up. If you like, you can add some flavor to your beans by tossing in garlic, onions and/or herbs when you turn down the heat to start the simmering process. I’ve never tried this method, but I’ve read stovetop beans have a way of going from inedible to perfectly tender in a matter of minutes, so it’s important to keep testing them starting around the hour mark. Most beans take at least two hours to get to the right texture. You’ll know they’re done when you can squish one between your fingers and there’s no sign of toughness or hard spots in the core. Lentils cook much more quickly and don’t require soaking. They’re perfect if you don’t have any cooked beans on hand and need something to add to salads or toss in a dinner dish in a hurry. Start by rinsing lentils and removing any small stones or sticks. Place them in a saucepan with twice as much water as lentils, and cook as for stovetop beans for 25 to 30 minutes. Red lentils take a little less time, around 15 minutes. Drain any excess liquid before serving. My preferred method for cooking beans is to use a pressure cooker, specifically an electric model like an Instant Pot, but stovetop cookers are just as speedy. If you have a hectic schedule and are still trying to get the hang of preparing whole plant foods without spending a lot of time in the kitchen, this is the method for you. Pressure cooking beans goes faster if you soak the beans first, but it’s okay if you forget. You can still rinse dried beans, dump them in the cooker and get good results. Follow your cooker’s instructions for liquid amounts and cooking times, or check out the handy charts on Hip Pressure Cooking. Cooking instructions also vary between different pressure cookers, so familiarize yourself with the owner’s manual for the model you have. Plant-based pressure cooking cookbooks like The New Fast Food by Jill Nussinow or Great Vegetarian Cooking Under Pressure by Lorna J. Sass are handy to have around to answer questions and help troubleshoot if you have difficulty with your pressure cooker. There’s a bit of a learning curve with some electric models, but it’s worth getting the hang of them since you can cook most beans in under 15 minutes if they’ve been soaked first! If you’re cooking chickpeas, save the water to experiment with aquafaba recipes! Since you’re likely to cook way more beans than you’ll use in one sitting, plan to store the leftovers. Use airtight containers to separate out single servings or meal-sized portions. It’s up to you whether to store the beans in the cooking water or drain them first. I drain it off, but if you use the stovetop method and flavor the water, you may prefer to save it. Okay, so now you’re a bean cooking boss. You have a fridge or freezer full of beans. Why make them a staple of your diet? Is eating beans every day good for you? Beans are lower in calories than animal proteins and contain none of the potentially harmful fats and pro-inflammatory compounds. They’re also nutrient-dense, boasting high levels of iron along with a range of B vitamins and minerals, including magnesium and potassium. There you go! You’re all set to rule the kitchen with your newfound bean cooking prowess. Whole grains are a staple of plant-based diets, but if you’ve ever wound up with a pan full of gummy rice, you know cooking them the right way is essential if you actually want to enjoy what you’re eating. No worries, we’ve all been there! (Ask me about my adventures with buckwheat, for example…) Fortunately, cooking whole grains isn’t hard once you know the right amount of water to use, the optimal length of time to cook each grain and the how to achieve a deliciously fluffy texture. You’re probably already familiar with a few like oats and brown rice, or you might be new to the world of whole grains. Either way, let me share what I’ve learned experimenting with plant-based cooking and few tips from other talented cooks to help you master the technique of cooking perfect grains. This is all thanks to making one simple swap in your diet. As part of a completely plant-based lifestyle, whole grains contribute to a balanced diet and complement the benefits of everything else you eat. The most common method for cooking whole grains is to simmer them in water on the stovetop. To add extra flavor, use low-sodium vegetable broth instead of water or toast the grains over medium-high heat, stirring frequently, before cooking. Toasted grains are done when they smell nutty and are lightly browned. Remove the lid, fluff and serve! If you want to cook large batches of grains, a pressure cooker or Instant Pot is more efficient. Liquid ratios and times are different from stovetop cooking, so consult the booklet that came with your cooker for the best cooking method. You can also refer to the charts for whole grains and rice from Hip Pressure Cooking, which I find to be the most accurate of all I’ve used. What Whole Grains are Best to Eat? If a client asked me this, I honestly would have to say, “ALL of them!” Every time you choose whole grains over refined, you do your body a huge favor. But there are some grains that are more nutrient-dense than others, meaning they have more nutrients per calorie. Whether you’re completely plant-based already or making the switch, you want to include as many nutrient-dense foods as possible to maximize the health benefits of your diet. What makes these the best? They’re high in fiber, trace minerals and antioxidants, and they contain ample protein. Many of these grains are also beneficial if you’re trying to keep your blood sugar in check. The USDA Dietary Guidelines suggest 5 to 8 servings of whole grains per day, and the Physician’s Committee for Responsible Medicine (PCRM) recommends at least five. A serving works out to about 1/2 cup cooked grains, 1 slice of bread, 1/2 of a bagel or 1/2 of an English muffin. Whole grain pasta serving sizes vary, but the most common is 2 ounces of dry pasta. Where Does Plant-Based Protein Come From? It’s still one of the most common questions asked about plant-based diets. If you’re already plant-based, people want to know where your protein comes from. If you’re considering a plant-based diet, you might be wondering which foods to eat for protein and whether you can get enough after making the switch. Despite projections that the worldwide plant-based protein market will be valued at over $10 billion by 2020, protein is still largely equated with meat. Most meals contain some kind of animal protein, be it eggs in a breakfast sandwich, chicken on a salad at lunch or a burger for dinner. When you’ve spent the majority of your life eating that way, you don’t think about replacing animal foods with plant proteins — you just picture the eggs, chicken or burger disappearing. But whole plant foods are far from lacking when it comes to protein. When you exchange meat and other animal products for foods like beans, whole grains, nuts, seeds and leafy greens, you get all the protein you need and enjoy the added benefits of the fiber, antioxidants, vitamins and minerals found abundantly in plants. Protein sometimes gets downplayed in the plant-based community, perhaps in an effort to dethrone it from its centuries-old pedestal of being the stuff of life. However, some fuss about protein is warranted because of what it does in your body. Muscle, skin, hair, nails, etc. In an emergency, the body can also use protein for fuel. This usually happens during severe caloric restriction when adequate fuel from carbohydrates and fats in unavailable. Is plant-based protein good for you? You bet! Just like with carbohydrates and fats, protein doesn’t exist in a vacuum. In animal foods, it comes in the company of vitamins and minerals but also brings along high levels of saturated fat, pro-inflammatory compounds, hormones and, in the case of factory-farmed meats, antibiotics and pathogens. Plant protein foods, on the other hand, are generally low in fat (or contain beneficial fats), high in fiber, loaded with antioxidants and devoid of cholesterol. The perceived trouble comes from the fact that some plant foods lack adequate amounts of one or more essential amino acids when consumed alone. However, since the process of transamination reconstructs proteins from amino acids found in all the things you eat, your body doesn’t need to get all nine amino acids at once from a single food source or even a single meal. Many plant-based dishes also naturally combine two “complementary” proteins without the need for meticulous dietary planning. In beans and rice, for example, methionine is lacking in the beans but not the rice, and the beans have the lysine that’s low in rice. It’s a natural (and delicious) combination found in just about every cuisine worldwide. What this all boils down to is one basic truth about plant-based diets: you will get enough protein if you consume adequate calories from a variety of whole plant foods. The RDA for protein is 0.8 grams per kilogram of body weight, which you can calculate by dividing your weight by 2.2 and then multiplying the resulting number by 0.8. It’s not much at all — for a 2,000-calorie per day diet, it works out to around 10 to 12 percent of calories, which is easy to achieve with plant proteins. In these cases, it’s important to work with a plant-strong health coach, dietitian or nutritionist who can assess individual protein needs and create an appropriate meal plan. Okay, so plants do have protein, and you’re not going to turn into a wilted stalk of celery if you only eat plants. But just like with any lifestyle change, you need to make sure you approach your plant-based journey the smart way. That means knowing your protein sources and making them part of all your meals! Measurements are for cooked grains and beans. Which plant-based protein is best? There’s really no reason to choose just a few and leave the others out. Since you can get all the essential amino acids by eating a variety of plant foods, the best approach is to do just that every day. Try some split peas in your soup. Put tempeh in your sandwich. Whip up a chickpea flour omelet for Sunday brunch. Add beans to everything. And you can never go wrong with leafy greens. The next time someone asks you where to find plant-based protein in food, you’ll know exactly what to tell them — and maybe have a tasty recipe to share, too! Want more tips on powering up with plant protein? Follow me on Facebook! Won’t a High-Carb Plant-Based Diet Make Me Fat? There’s a lot of debate out there about high-carb vs. low-carb diets and the potential benefits of one over the other, and it’s led to an equally large amount of confusion over whether carbohydrates, or “carbs,” are good or bad for you. This post isn’t meant to settle that debate but rather to shed some light on one of the main points of this confusion: the difference between whole and refined carbs. At 4 calories per gram, carbs are found in a wide variety of foods, and they all tend to be lumped together in the high- vs. low-carb debate. But there’s a big difference in how whole carbs from foods like fruits, vegetables and brown rice and refined carbs like those in white bread, sugary desserts and sweetened drinks affect your body. And, strangely enough, the calorie content actually increases about 7 percent! 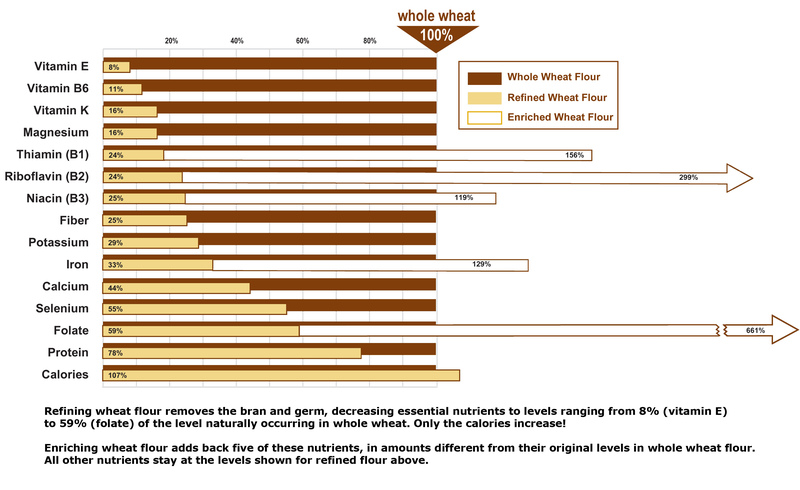 “Enriched” wheat, for example, has only about 5 percent of the vitamin E and 22 percent of the fiber of whole. The lack of these nutrients contributes to what refined carbs do to your body. Synthetic vitamins and minerals aren’t used as efficiently as nutrients found in whole foods, partly because they’re delivered in the wrong proportions and aren’t accompanied by a full spectrum of supporting nutrients. These effects put you at a higher risk for chronic diseases like heart disease and type 2 diabetes. Research also suggests that low-fiber diets may be linked to a higher risk of colorectal cancer. Pastries, snack cakes, donuts, muffins, etc. Leaving carbohydrates intact preserves the bran, germ and endosperm as a complete package the way God intended. Think about it: A grain is really a seed. Seeds need a wide variety of nutrients to germinate and then grow and thrive into full plants. When you eat a whole grain, you get these nutrients in the right forms and the proper proportions to support the health of your whole body. Switching from refined carbs to whole carbs means benefiting from the vitamins and minerals removed during refining plus a whole range of antioxidants, including flavanoids and polyphenols. These powerful phytochemicals aren’t found in processed foods and can’t adequately be added through “enriching” because their combinations in foods and interactions in the body are still largely a mystery. Studies suggest attempting to use isolated antioxidants to treat disease or improve health can actually have the opposite effect. Getting antioxidants from foods like whole grains and other whole carbohydrates, however, preserves the natural balance and allows these compounds to work as they should, protecting your body at a cellular level. How does this “whole package” benefit your body? What Foods Are Whole Carbs? Pretty much all whole plant foods contain at least some beneficial whole carbohydrates. Many are packed with a wide spectrum of nutrients but are low in calories, and all have the potential to improve your overall health when eaten regularly and in various combinations. The best way to think about the carbs in a plant-based diet is to stop picturing “carbs” as a food group and start thinking of food as food! Whole grains like brown rice, quinoa, spelt, millet and amaranth are all good sources of whole carbs. So are leafy greens, crunchy veggies, starchy veggies, fruits and beans. Even nuts and seeds contain a small amount of carbs. Therefore, making whole plant foods the bulk of your diet means getting all the benefits of carbs without the negative side effects of refining. So what does all of this have to do with weight? Can you safely adopt a high-carb plant-based diet without seeing the scale go up? Short answer: Yes! In fact, swapping out refined carbs with whole carbs can actually help you lose weight. How does that work? First, fiber contributes to the feeling of satiety, so if you eat unrefined carbs like those listed above, you feel full sooner and stay full longer. Second, whole carbs are much more complex than refined and take longer to be broken down by the body. This eliminates the spikes and drops in blood sugar you get after eating refined carbs, so you don’t feel “high” after you eat only to completely crash and get shaky and hungry an hour later. You wind up eating fewer calories without feeling deprived, making it easier to lose unwanted weight and maintain a healthy weight once you reach your goals. Fruits, veggies, nuts, seeds, etc. Need some help boosting your whole grain intake? along with weekly tips, tricks and recipes. They’re all common objections when one person in a household goes plant-based and the others aren’t quite there yet. Feeding a family that’s reluctant to embrace a meatless lifestyle can be a challenge, especially if you’re just starting out on the plant-based journey yourself. If you’re worried a plant-based family meal plan is going to be met with groans, rolled eyes or outright rebellion, don’t be! Use these “secret weapons” to conquer objections and serve up amazing meatless meals to please the picky eaters in your household. When your family complains about missing meat, they’re probably missing a flavor rather than a food. It’s called “umami,” and it’s sometimes considered the fifth taste along with sweet, salty, sour and bitter. Derived from Japanese for “deliciousness,” umami describes the taste of foods with a lot of the amino acid glutamine. Meat and aged cheeses are often equated with umami, but there are plant sources of glutamine that can infuse dishes with the same flavor and satisfy the taste buds of the staunchest “meat and potatoes” members of your family. Sometimes the best way to introduce meatless meals to meat eaters is to simply swap the meat in recipes you already enjoy for a plant-based option. Lentils, tempeh, portobello mushrooms and seitan all have the “meaty” texture the picky eaters in your family crave. They’re also hearty enough to appeal to even the most skeptical meat lover. As your family becomes more accustomed to eating meatless, you can start serving dishes with more unique flavors, like curry, stuffed squash or lentil loaf. Getting picky eaters to try new food takes patience whether or not you’re plant-based! Kids like what’s familiar, and if they’re not used to eating a lot of vegetables, it’s going to take some time for them to warm up to the idea of meatless meals. You may have to serve a new food 10 to 15 times before your kids will agree to eat it. And don’t forget the perennial family favorite, pizza! This option is especially fun because kids can get in on the action by helping you make dough and add toppings. If there are some veggies they already like, encourage them to try one new topping each time you make a pizza together. When you start a healthy lifestyle, it’s natural to want to share it with everyone, especially your family. After all, you care about them and want them to get all the benefits you’re getting. But be prepared to accept the fact that they may not be ready to jump in all at once. More than likely, you’ll have to take things one meal at a time, using simple swaps to bring new foods to their plates. It’s okay to be “sneaky” at first, especially with kids. Feel free to blend veggies into pasta sauce, use beans in brownies or call broccoli “little trees” as you stir it into their mac and cheese. Avoid labeling foods as “bad” or “good;” instead, set a positive example by treating yourself well and practicing healthy habits. The improvements your family sees in your well-being provide an incentive for them to make their own beneficial health choices. And if your kids watch you enjoying plant-based foods, they might be more inclined to ask for a taste. Involve everyone in shopping and cooking when you make meatless dishes. This puts plant-based eating in the positive context of family togetherness and gives kids a chance to choose which new ingredients they want to try. It also helps make whole plant foods more fun and banishes the idea that they’re somehow going to be “deprived” if meat disappears from the menu. In the end, it isn’t about whether your family dives into a plant-based lifestyle headfirst or not. Meals should be a time for spending quality time together, and serving healthy meatless meals with flavors everyone enjoys is just one way to show you care. Remember to be patient — it can take a while for everyone to get used to plant-based eating, and some of your family members may never get there. Keep your health goals in mind, and respect where everyone is in their own journey toward eating and living better. Looking for more plant-based tips and info? Follow me on Facebook! Dinner is often the biggest challenge for people considering going plant-based. Think about a typical evening meal in your house. Most likely, you’re picturing a plate with a starch, some meat and a vegetable, and maybe a small salad on the side. The mistake most prospective plant-based eaters make is imagining the meat disappearing (and possibly the starch, if it was cooked with butter or topped with sour cream) and leaving them with very little to go on. I think this is why it’s so easy to over-complicate plant-based dinner ideas. You get into the mindset of having to re-create your entire meal plan, and it’s overwhelming. But I’ll let you in on a secret — adopting a plant-based diet doesn’t require you to turn dinner prep into a cooking show. You probably have some meals you eat on a regular basis right now, and you don’t have to change a thing about that plan besides swapping out the animal products and processed foods in favor of whole plant ingredients. If you follow these four tips, you’ll never run out of simple plant-based meals for dinner. As a bonus, you’ll speed up prep time and be able to enjoy more leisurely evenings. Remember the plate you pictured? That’s the template of your current dinners. Getting started with plant-based dinners is easier if you think of your new meals in the same way. Templates are better than recipes because they give you a basic formula you can follow with any ingredients you have on hand. There’s no pressure to hunt down specialty ingredients or run to the store if you’re missing just one tiny piece of the puzzle. You’ve probably heard over and over the importance of planning weekly meals in advance, and that’s because it’s good advice. Chances are you already approach cooking with this mindset. The family comes home and expects tacos on Tuesday or pizza on Friday or whatever your tradition happens to be. If you use templates to come up with plant-based family dinner ideas, you can have a pasta night, a bean and rice night and a soup night every week without ever getting bored. Sit down at the beginning of the week, and write out a list of the template “recipes” you want to make. Choose your ingredients based on sales at local stores or what’s in season at the farmers market, and take note of the items you can stock up on, such as pasta, beans, canned tomatoes or frozen veggies. Get the family involved in the process so that everyone is on board with the plan and you don’t get caught off-guard by your teenage son suddenly demanding a burger five minutes before dinner on soup night. Nothing makes for a quick, easy plant-based dinner like batch cooking. I touched on this a bit when I talked about breakfast and lunch, and it works just as well for the evening meal. The concept is simple: Instead of cooking a new dish every night, prepare meals and batches of ingredients once or twice a week. The easiest way to do this is with an electric multi-cooker like an Instant Pot. These “set it and forget it” appliances can be used as pressure cookers, slow cookers, rice cookers and more, so you can prep your meals when you have time and let them cook while you go about your daily routine. Invest in a cooker large enough to prepare multiple servings of food for the number of people in your family so that you can maximize your batch cooking time. You can either cook double or triple batches of foods from your “templates” (chili and soup work particularly well) or components like beans, rice and pasta sauce. While the food is cooking, you can even prep ingredients for side salads and store them in airtight containers in the fridge to throw together while reheating leftovers during the rest of the week (they’ll stay fresh for about four days). Store your batch-cooked ingredients or meals according to the directions for lunch leftovers, and there will never be a night where you’re at a loss for what to eat. Once you become familiar with preparing your template recipes and adapting them for batch cooking, it’s time to get creative. Borrow some plant-based cookbooks from the library, browse Finding Vegan or search through the numerous blogs penned by aspiring chefs across the web to find something mouth-watering that strikes your fancy. Set aside time to shop for any special ingredients, and pick a day when the whole family will be home to prepare the dish together. Turning a complex recipe into a family “party” takes the fear out of tackling a lengthy ingredient list and makes the finished product more satisfying for everyone. Don’t wait for a holiday or special occasion to try your first “crazy” plant-based dinner recipe. Make them any time of year, and don’t forget to make extras so that you have leftovers to serve during the rest of the week! So what favorite dinner dish will you start with? There are so many options, don’t be surprised if you find yourself wanting to try them all. Enjoy a new quick plant-based dinner every night — without driving yourself crazy or spending your life in the kitchen. Discover more delicious plant-based dinner recipes! and weekly content to help you life a vibrant, healthy life.